It’s been a while since I decorated a dorm room. Over a decade, in fact. And while at the time I felt pretty jazzed on my Ani DiFranco poster, ironic Charlie Brown sheets and myriad hippie-inspired tapestries, my design sensibilities have come a long way since my days in Middlebury, Vermont. Now don’t get me wrong, I’m not about to tell you to go minimalist on your decor — that’s simply not my style. I love mixing tons of patterns and prints, but in a slightly more organized fashion that makes for a productive and happy living space. 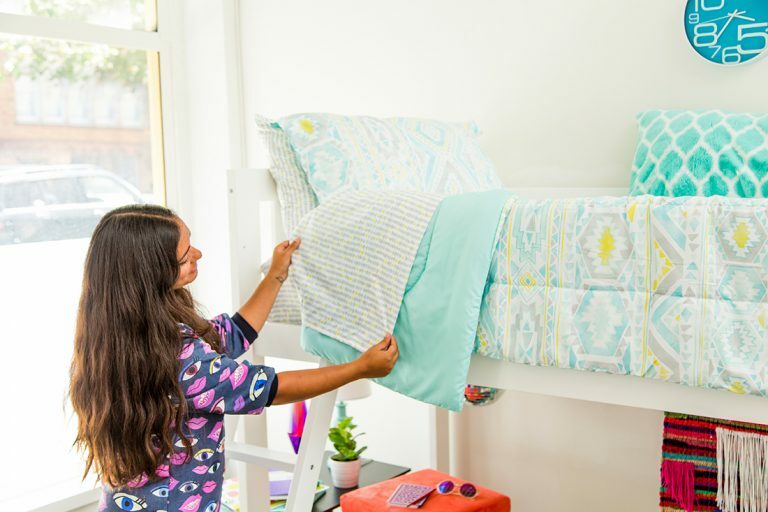 We’ve teamed up with Walmart to share my tips and tricks for creating a dream dorm room that you can actually afford. 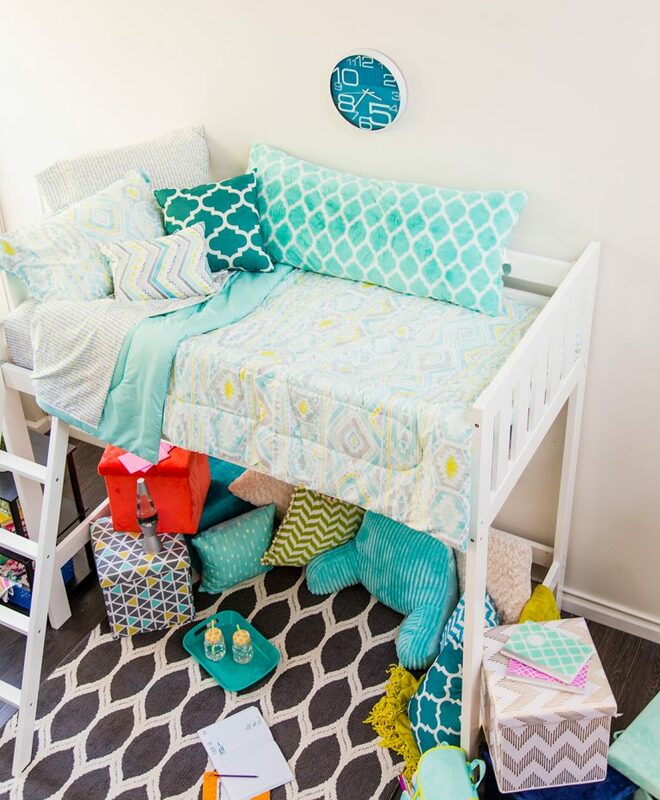 First things first, you want to come up with a basic color scheme and overall vibe. You need to incorporate your personality without bringing in your old high school tricks like collaging magazine cut-outs of hot celebs on the back of your door. The celeb collage was cool in high school-leave it there. And you know what else you can leave in that high school bedroom? Pastoral florals. Buh-bye. 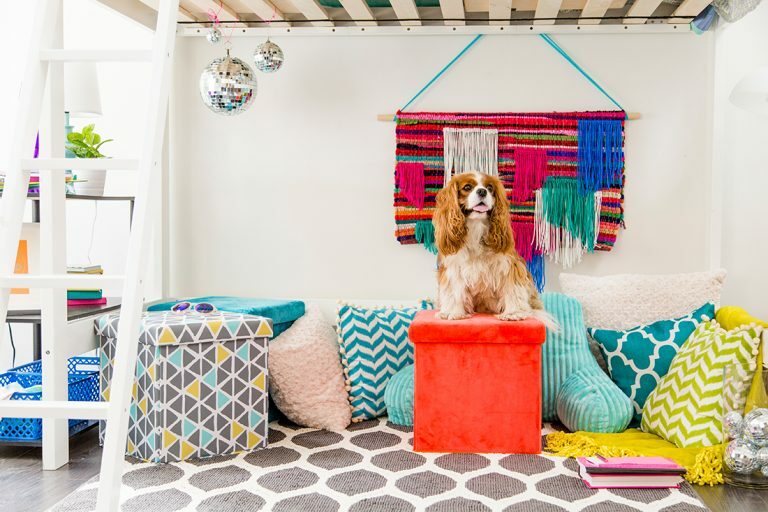 For me, it’s all about a mix of cool, airy hues, pops of gem tones and plenty of patterns and texture. 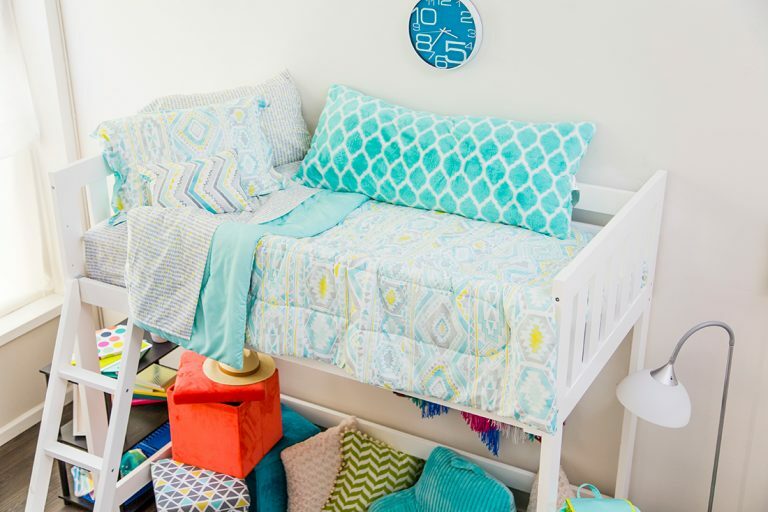 It’s ideal to choose bright colors and to use plenty of white in your room to make it feel bigger. As you can see, a light shade of aqua is dominant throughout this space without overpowering it. The bed in a bag is pretty much the jam. In this bundle, you’ll get sheets, a comforter, a pillowcase and a fancy pillow sham — and all of it is machine washable. WINNING. I particularly love how this bed in a bag features a whole bunch of different patterns that work together. 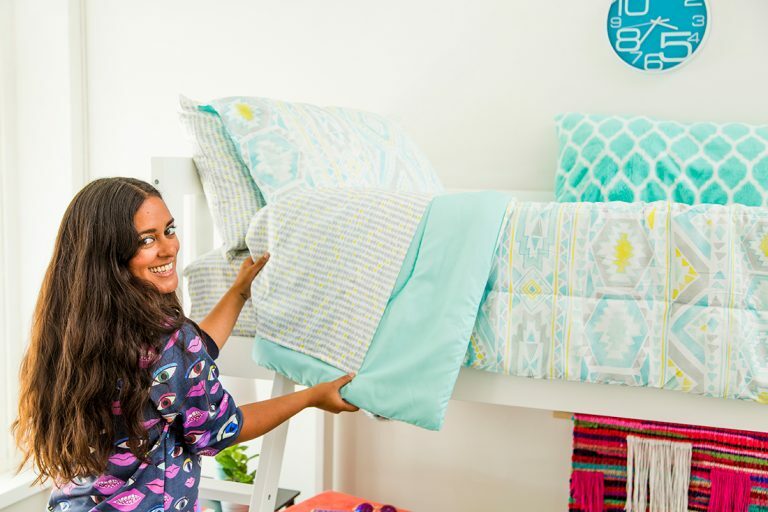 Because your bed is probably the largest piece in your room, let your bedding set the tone for the entire room. 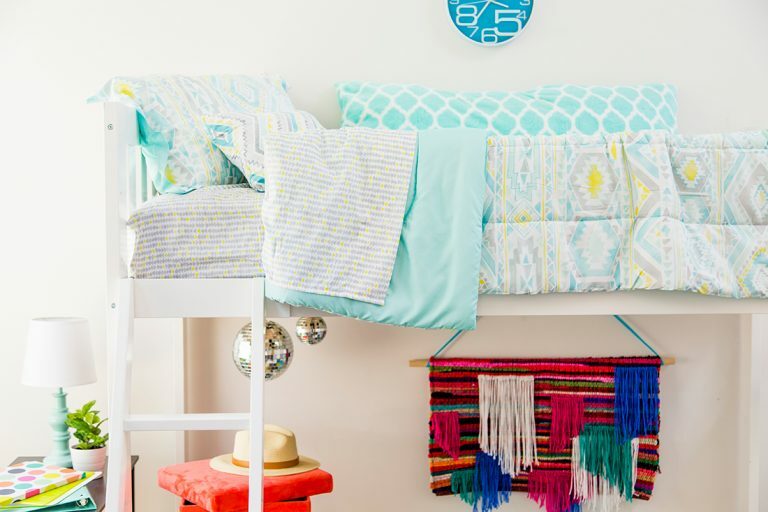 The beauty of a lofted bed is that it makes that little half room of yours double in size, instantly. Plus, that space underneath is the perfect little study cove. 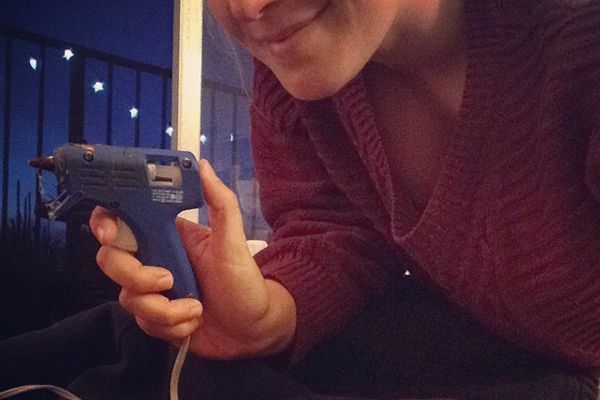 Now, time to get that under-the-bed zone ‘fitted up. 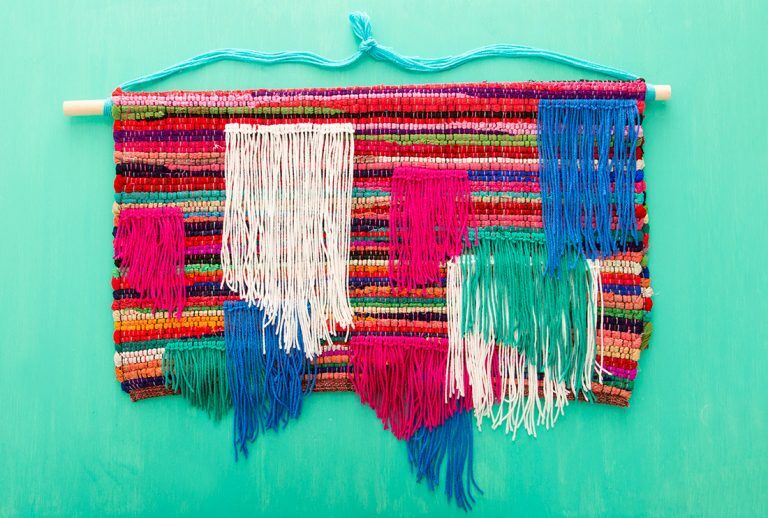 Dear Rug, meet Yarn. We think you’re going to be lifelong friends. I roped in a helper for this portion of the dorm room makeover. 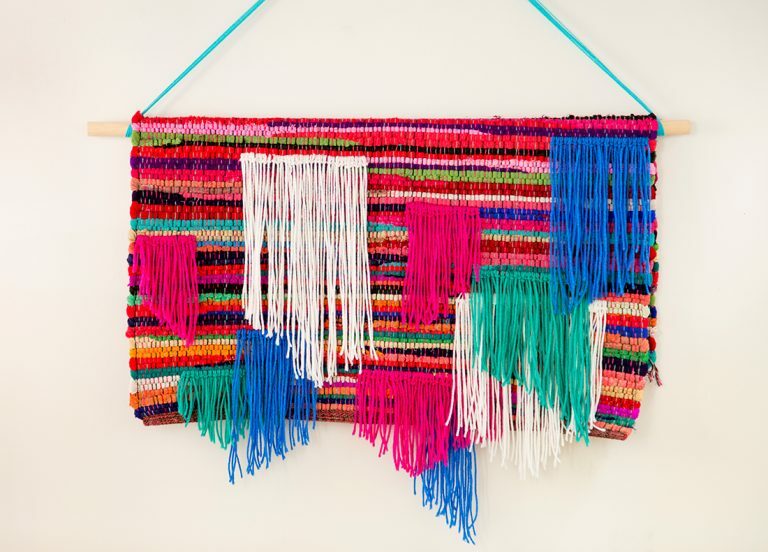 Our fearless Creative Content Producer Maddie Bachelder was kind enough to lend her creative skills to this totally DIY-able piece. 1. Cut several lengths of yarn about three feet long. 2. Fold a piece of yarn in half. 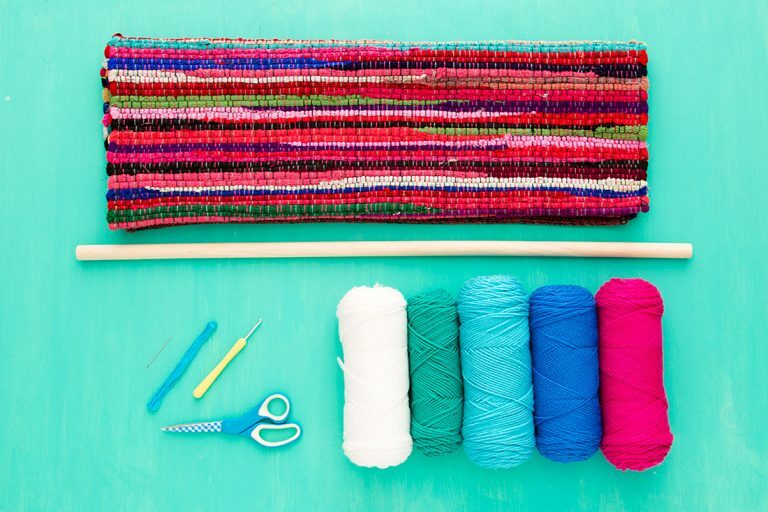 Starting at the base of the rug, tuck the crochet hook through one of the loops in the rug, hook the top loop of the yarn on the crochet hook and pull the loop through. 3. Pull the two ends of the yarn through this loop, then tighten. Using the same color yarn, repeat this many more times in a row, then trim the yarn. 4. 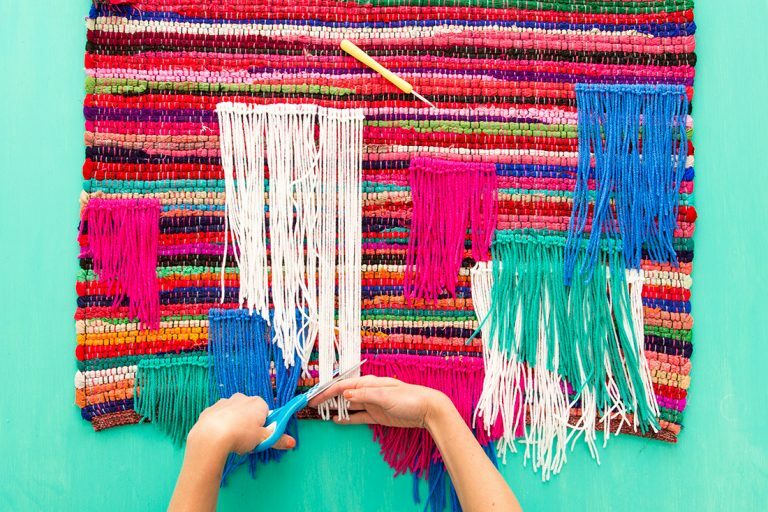 Make more lines of yarn in different colors up to the halfway point on your rug. 5. 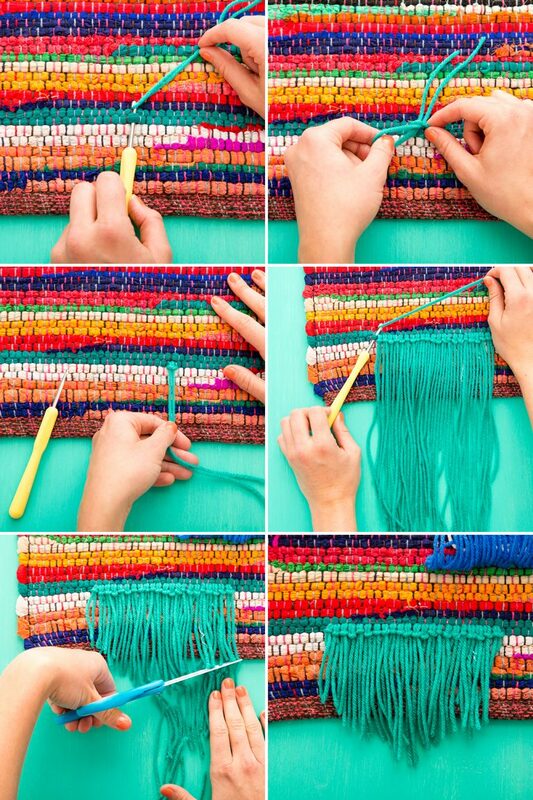 Fold the rug in half over the dowel, then use embroidery thread to stitch the rug in place. 6. Loop more yarn around the two edges of the dowel, then tie these pieces together in a firm knot. Hook this knot on the wall, then call it a day! 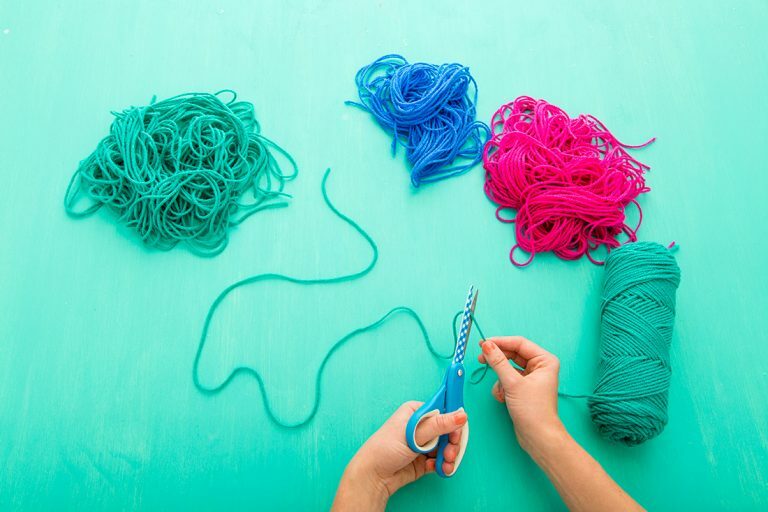 Start by cutting several lengths of yarn about three feet long. Fold a piece of yarn in half. Starting at the base of the rug, tuck the crochet hook through one of the loops in the rug, hook the top loop of the yarn on the crochet hook and pull the loop through. Then, pull the two ends of the yarn through this loop and tighten. Using the same color yarn, repeat this many more times in a row, then trim the yarn. 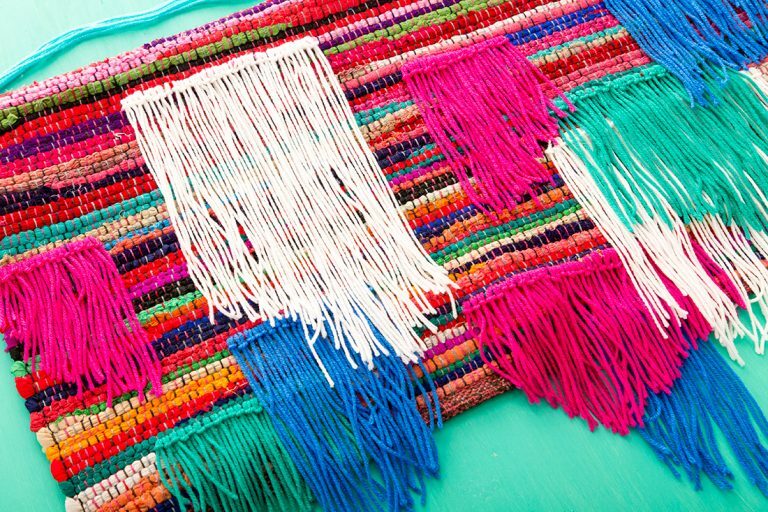 Make more lines of yarn in different colors up to the halfway point on your rug. Fold the rug in half over the dowel, then use embroidery thread to stitch the rug in place. Then, loop more yarn around the two edges of the dowel, then tie these pieces together in a firm knot. Hook this knot on the wall, then call it a day! How easy is that? It’s simple but on the slightly time-consuming side, so we recommend making your own version while binging on Netflix or listening to your roomie’s latest trials and tribulations in the world of love. Or both. When you’re dealing with making a small space cozy, it’s all about layers and layers of textiles. I picked up a whole bunch of pillows and blankets to make one corner of this cove a great spot for chilling, studying and napping. My favorite comfy piece in this zone is definitely the classic “boyfriend” pillow — officially dubbed a bedrest pillow. Pay homage to your parents’ (or grandparents’) generation with a couple kitschy pieces from the ‘70s. 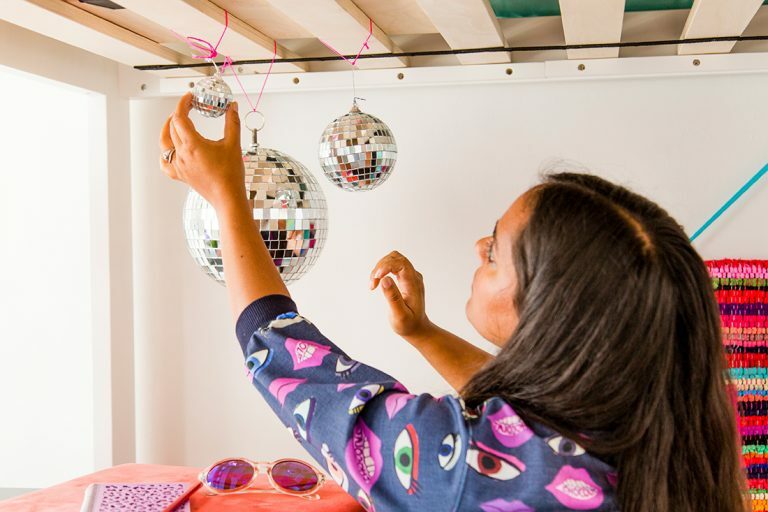 Disco balls first came back in the ‘90s, and are now enjoying yet another trendy resurgence. 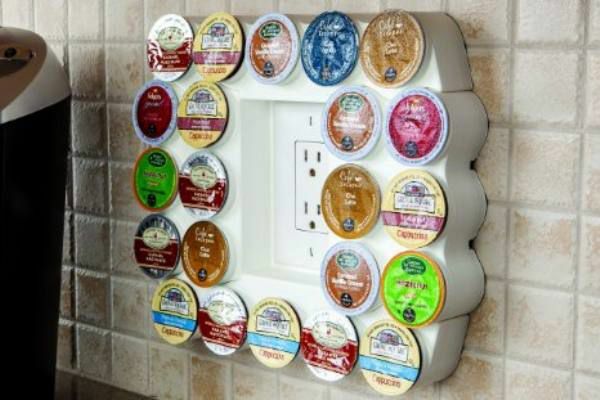 Finally, you need smart storage solutions. 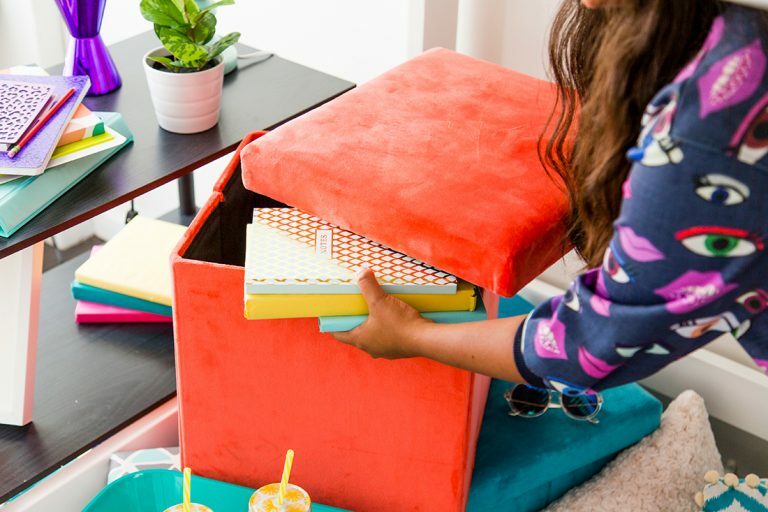 The plastic stacking drawers we all know and love are a must, but you can take your style to the next level by stocking up on a couple of collapsible storage ottomans. Use them as chairs when you have friends or family over, and hide all your knick-knacks while you’re at it. Short on car space and time? Use Walmart Pickup! 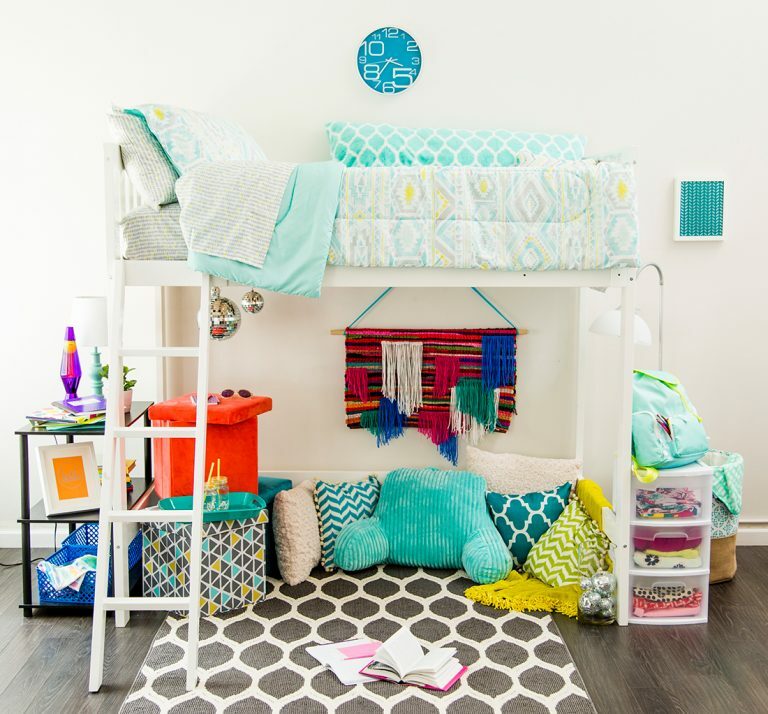 Order all your dorm decor essentials online, then pick them up at the Walmart location nearest to your school. This post is a collaboration with Walmart.